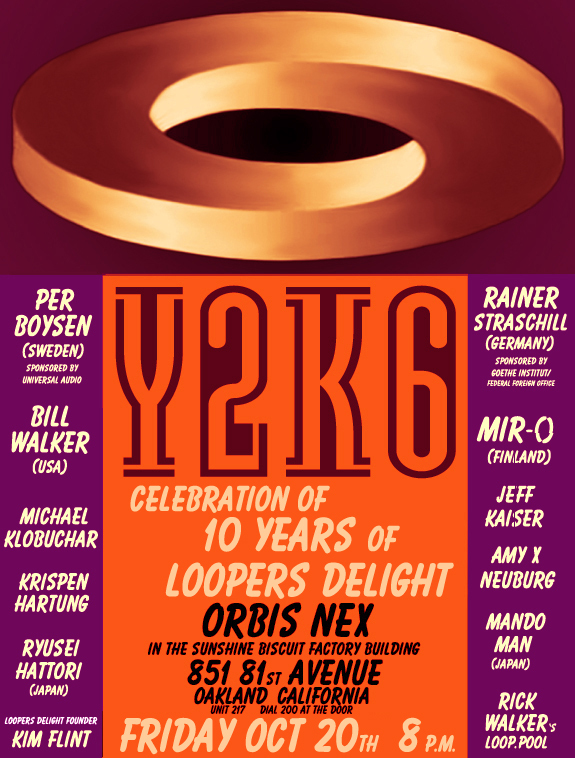 The Main Y2K6 Festival occurs on October 21 and 22 (Saturday and Sunday), at ALCHEMY, 120 Pearl Alley, Santa Cruz, CA. Alchemy is located in the northern side of the parking lot that borders Pearl Alley at the corner of Lincoln and Cedar Streets, one block due west, of the Pacific Garden Mall. Over 50 artists from around the globe will converge on the San Francisco Bay Area this fall for the Fifth Annual Y26K Live Looping Festival. Perfomers from across the United States and as many as 10 other countries will appear in Santa Cruz, Calif., on October 21 and 22, for the main two days of the festival. Additional festival-related events will be held in San Jose, San Francisco, and Oakland during the week preceding the main festival. The brainchild of live looping artist and promoter Rick Walker, Y26K and other looping festivals he has created have inspired similar festivals in 15 countries around the world, including the Zurich Live Looping Festival last summer, which drew 40 artists from nine countries over its three days. 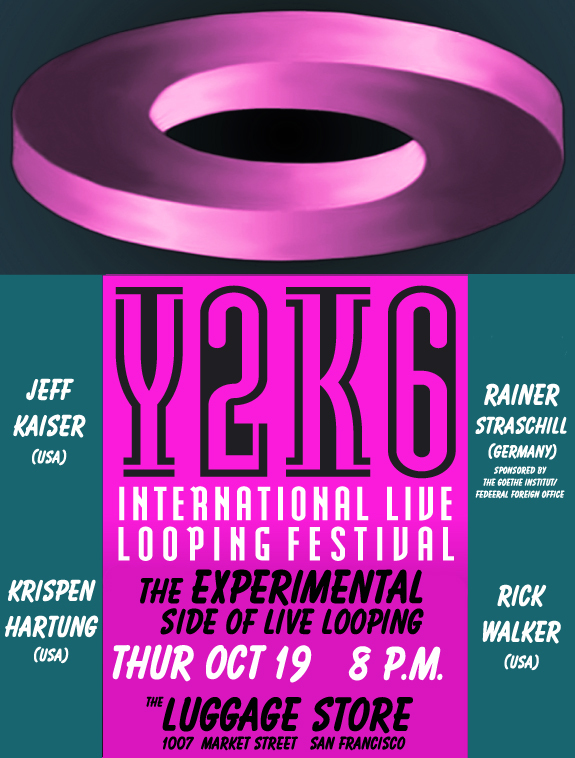 In a demonstration of the technological edge defined by the live looping genre, the Y26K festival will be streamed in real time to the web, and will feature a real-time Internet jam, using NINJam technology, between musicians at the festival and live loopers from Europe, the UK, South America, the Near East and Japan. This years event coincides with the 10th anniversary of loopersdelight.com , the website that serves as the central gathering point and information exchange for the international live looping movement. Loopers Delight currently receives over a million hits a year now. Looping is a broad class of music based on the idea of performances and recordings built using long delay lines. Looping artists use a variety of sources to generate layered textures which are manipulated in real-time in various ways (including reversal, time or pitch shifting, etc. ), resulting in complex interactive compositions. 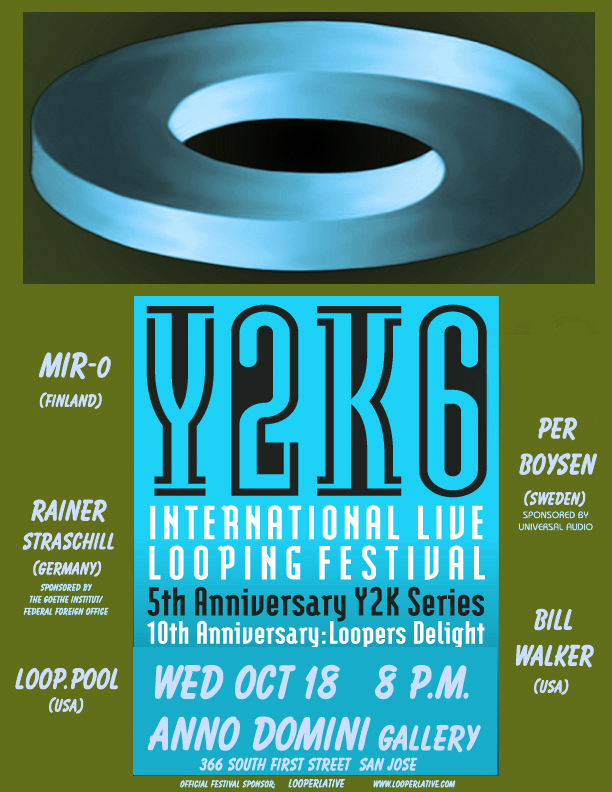 The breadth of the looping genre will be well demonstrated at the Y26K festival, which will guitarists, cellists, trumpet players, solo singers, fusion bands, avant-garde musicians, circuit benders, abstract electronica artists, even comedians and spoken word artists. What is fascinating about the loopers community is that it is a tightly knit group of musicians and sound artists not tied by style of music. With the use of delay lines as a medium being the only commonality, the range of musical styles created by loopers is diverse and may be, by turns, hypnotic, propulsive, ethereal, or simply bizarre. In another sign of the dedication of looping devotees, neither the festivals organizers nor the musicians performing at the festival receive any compensation, and all travel at their own expense. The high level of activity in the fast-growing live looping field has had a huge impact on the rapid development of its technology in the past three years. Some looping artists and other members of the community run small companies designing live looping tools. Some examples include Matthias Grob of Brazil, inventor of the Gibson Digital Echoplex; Bob Amstadt , creater of the Looperlative, currently the most sophisticated live looping hardware device; Andrew Ostler, with his Augustus Loop; and Jeffrey Larsons Mobius. As a result, in addition to its musical role, the Y26K festival has also consistently served as the site for world premieres of this cutting-edge technology. RAINER STRASCHILL and MIR-0 8 p.m.
"Y2K6 International Live Looping Festival: main festival"
At 7:20 p.m, the Mayor of Santa Cruz, Cynthia Matthews, will present the headlining and featured artists with a proclamation declaring Saturday, October 21st "International Live Looping Day" in the City of Santa Cruz. Note: ALCHEMY is located in the northern side of the parking lot that borders Pearl Alley at the corner of Lincoln and Cedar Streets, one block due west, of the Pacific Garden Mall.